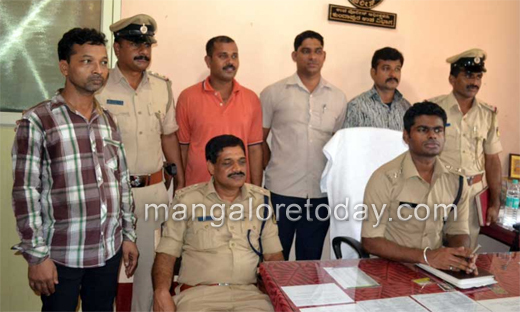 Kundapur, May 6, 2015 : Udupi District Superintendent of Police Annamalai who on May 5, Tuesday produced before the media Azar Afzal Khan alias Ajeya Babu (39), the accused in the case of the mysterious murder of Lalitha Devadiga in a Kundapur lodge recently, has said that the accused has confessed his guilt. The SP also informed that the accused has revealed during interrogation that he strangulated Lalitha Devadiga to death using a wire. The accused is of Gujarat origin. Initially, when the body of Lalitha was found in the lodge, it was suspected to be a case of suicide. But later the marks found on her neck had given room for doubt. The SP informed that the accused had been in hiding in three states after committing the offence and that he was arrested from the Mumbai Railway station by a special team led by DySP Manjunath Shetty, Circle Inspector Diwaker and inspector Nasir Hussain. The SP informed that Afzal who worked in a garment store in Mumbai was in love with Vaishnavi alias Shobha (33), daughter of Lalitha Devadiga. However Vaishnavi who was unaware of this had married one Jayasheela a few years ago. Later Azhar quits his job and in the recent years once again became friendly with the Lalitha Devadiga family and was even accompanying them on tours. In the meantime he even expresses his love for Vishnavi who falls for him, and asks him to convince his mother. Accordingly, he arrived in Kundapur to convince Vaishnavi’s mother and hires a room in a lodge on April 4 by producing his Aadhaar card as a document. He had lunch which Lalitha Devadiga who arrived at the lodge on April 15 and later raises the topic of marriage. When Lalitha refused, he as per his plan strangled her using the wire and escaped with her jewellery. Annamalai said in the meantime, Azhar and Vaishnavi plan to appear before the court without getting trapped by the police. In Mumbai a case of missing is registered as Vaishnavi goes missing. The accused later tries to make Vaishnavi write a death note to prove that Lalitha had committed suicide. The Kundapur police with the help of their Mumbai counterparts arrested Azhar while he was heading towards Ahmedabad in a train from Mumbai, Annamalai informed. Annamalai said the wire used by the accused to strangle Lalitha has been identified by the accused and that he had sold the jewels of Lalitha Devadiga in Mumbai. Lalitha Devadiga’s daughter Vaishnavi Devadiga has also been taken into custody by the Kundapur police for abetting the crime.